You know, Big Ben, the River Thames, the British Museum, Buckingham Palace, London Bridge… All the “must see” things that London has to offer. But, as it turned out, my first trip to London was completely different than what I was expecting it to be. Instead of cruising the Thames at night, I spent time watching the Opening Ceremonies from a London flat where we could see and hear the fireworks. 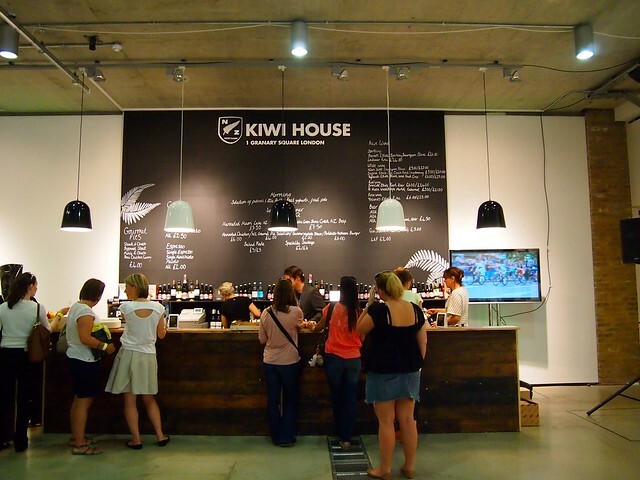 Instead of visiting museums, I ended up hanging out with other travel bloggers at Olympic team houses. And, instead of simply watching the Olympics on television, I got to see them live in person. I got to experience London in perhaps one of the most unique ways imaginable. I was there when the city was absolutely electric with an energy and spirit that can only go hand-in-hand with an international event like the Olympic Games. I was in London when the city came alive. I've heard conflicting opinions of London before — people have said it's big and loud, boring and unfriendly. “Grey” is often how I've pictured this world capital. But London was anything but in the 6 days that I spent there. The streets were packed with people from all over the world, dressed in colors to support their countries and athletes. 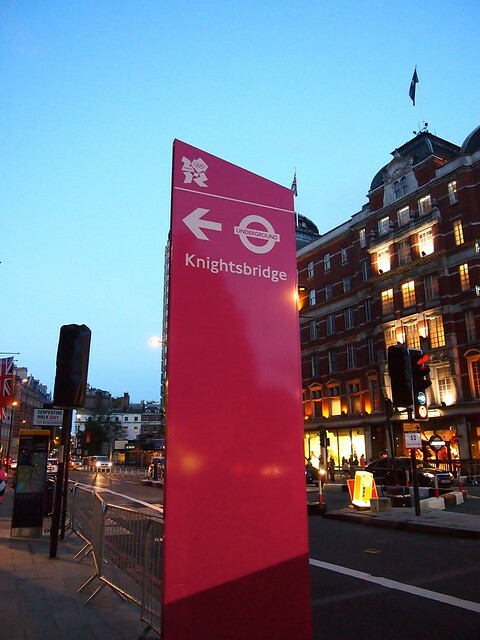 Colorful pink signs and purple-clad volunteers adorned street corners and Tube stations to help event-goers find their way. And, everywhere, people were smiling. I don't think I could have chosen a better time to visit London, even if I never got in all the “typical” sightseeing. To me, I saw London at its best. You hear lots of people talking about dreams and bucket list items. Among travelers, these lists usually consist of things like summiting Kilimanjaro or exploring Laos on a motorbike or riding the Trans-Siberian railway. 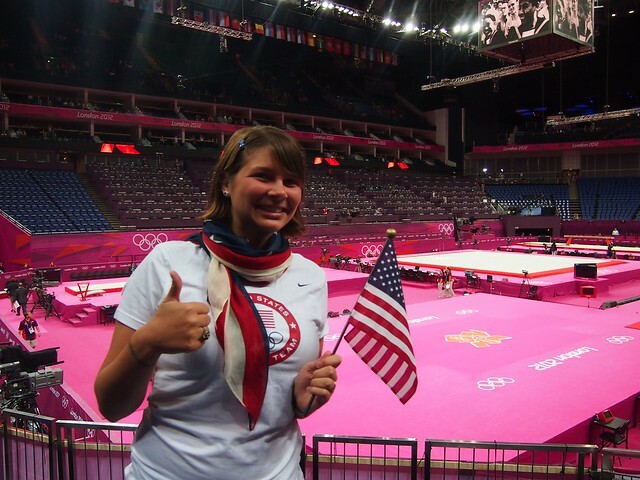 After devoting countless hours and plenty of blood, sweat, and tears to the sport myself for 8 years, Olympic gymnastics has always been the event I most look forward to at the Summer Games. And it's always been the only sport I've ever wanted to see live. It wasn't an item I thought I would be crossing off my bucket list in my 20s, though. Maybe not even in my 30s. I figured I would have to wait until the Summer Games came back to American soil before I'd have any prayer of getting a ticket and being able to afford to go. 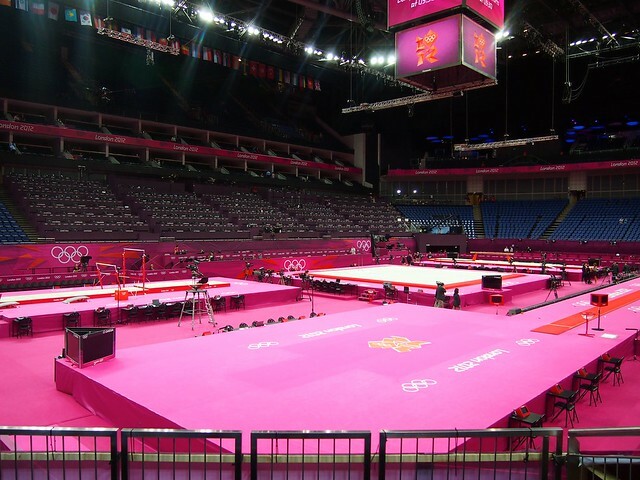 So imagine how surreal it was for me to step into London's North Greenwich Arena on July 29, ready to see some Olympic gymnastics happening live in front of me. 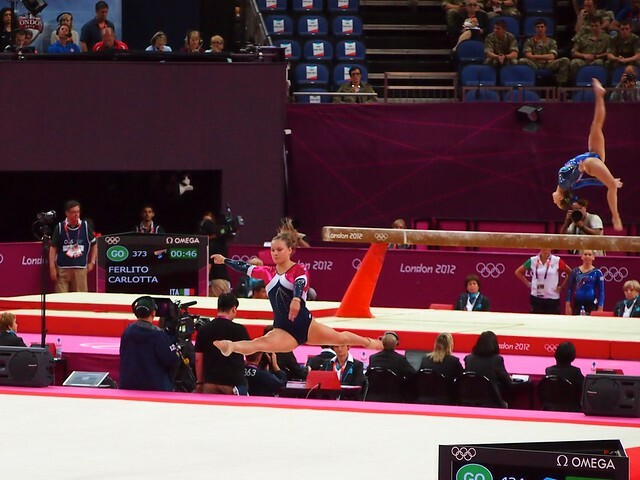 It wasn't the team final, the individual all-around, or even an event final. 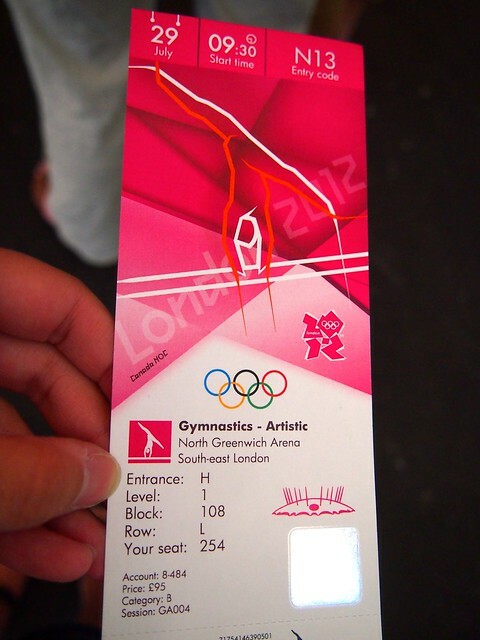 The only ticket I could get was for a qualifying round of women's gymnastics. But it didn't matter. It didn't matter that I wasn't seeing any medals handed out. It didn't even matter that I wouldn't even be seeing Team USA compete. It was enough for me to just be there. 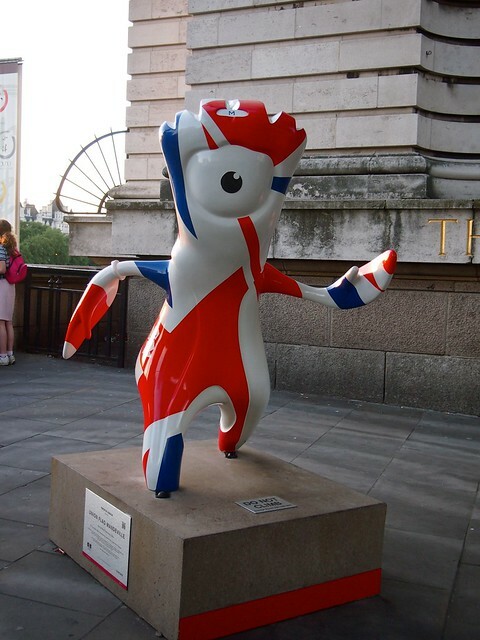 That's how I felt about being in London for the 2012 Olympics overall — it was great to just be there. I felt like I was a part of something. Something big. And that's really the whole point of the Olympics, isn't it? To bring the world together for 16 days of friendly competition and good spirits. I know I'll never forget my first Olympics experience. Thanks, London, for showing me a great time! 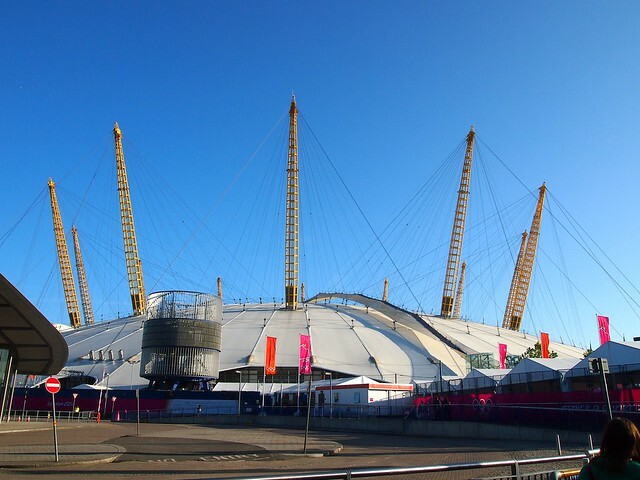 What sort of London 2012 experience did YOU have? Would you ever want to go to the Olympic Games? 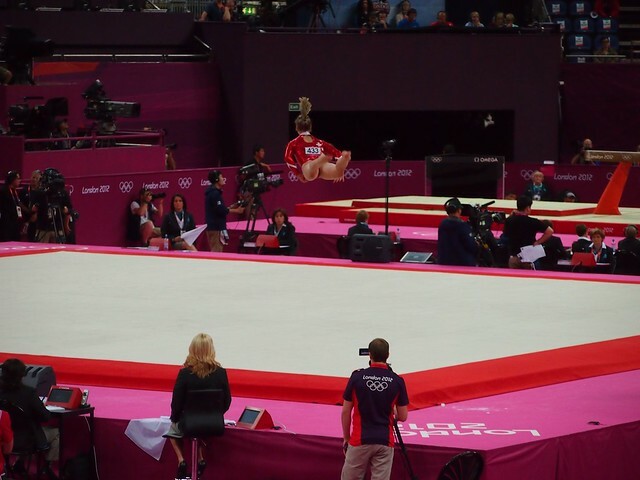 Some great action shots there, how fantastic to have been able to see any gymnastics at all. So glad to hear you had a fantastic Olympic experience (but you should come back to London to see the rest of the good stuff ;). I’m not even a big sports person, but I’d love to see The Olympics in person. 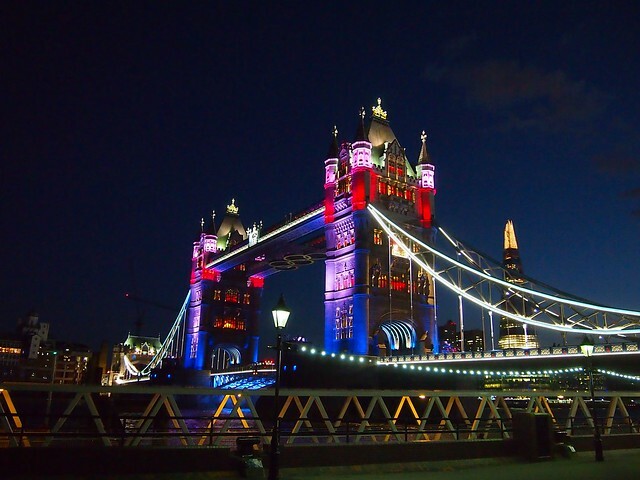 It sounds like it was an amazing experience, and all the typical tourist sites you missed out on this time will be there for your next trip to London. It was TONS of fun! Definitely something I’d do again. Nothing like seeing it live, I’ve heard. Makes me think I may have to make the trek to Rio, since *hopefully* I may have made my way down there by then *crosses fingers*. I didn’t know you practiced gymnastics! 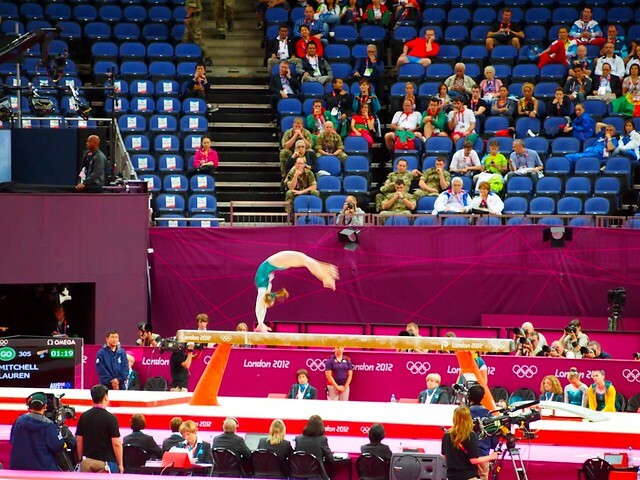 What was your favorite event when you competed? 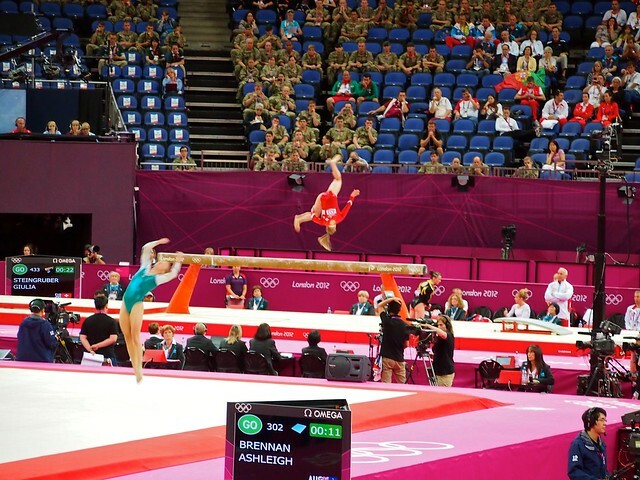 Which gymnast impressed you the most that you think didn’t get credit for attempted level of difficulty? Nope, really nothing like seeing it live and in person! Such an amazing experience. And yup! I was a gymnast for quite a long time. Never Olympic-level, of course – not even close! But I still loved it. 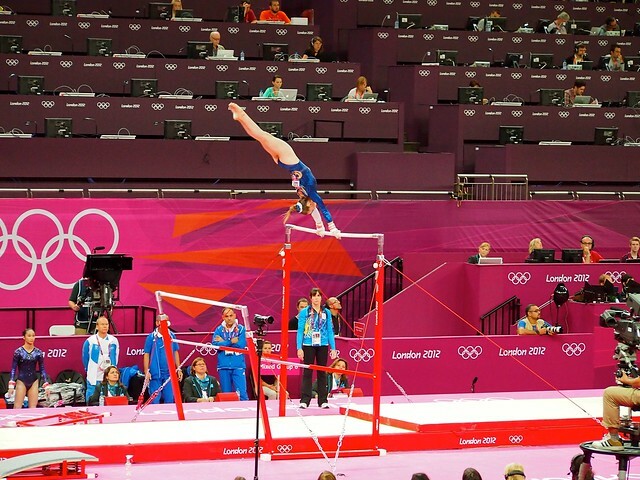 My favorite event always changed… I used to love beam, then bars, then floor. The only one that was never my favorite was vault! I hated vault. Well, what did you know? I’m from DR and had never heard of her! After doing some googling on her, I found out she has an amazing story. Practices in a gym with no electricity or running water, and most of the time, she doesn’t even have money to travel to meets. She’s practically the only elite gymnast in the country (baseball and basketball is what we do – medals in track these Olympics notwithstanding). 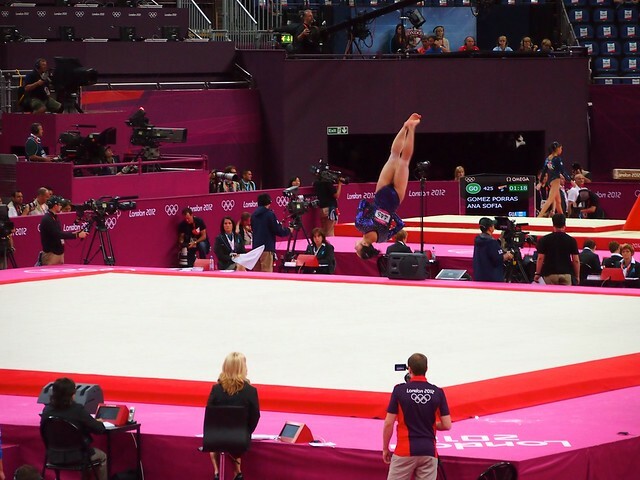 Yamilet was thisclose to making the Vault finals, classifying as 9th (first reserve). Thanks for the heads up about her cool story! Aww, she didn’t make the vault finals? That’s too bad! She was amazing! I’m even more glad that I got to see her in the qualifying round then! Agreed, Vanny! 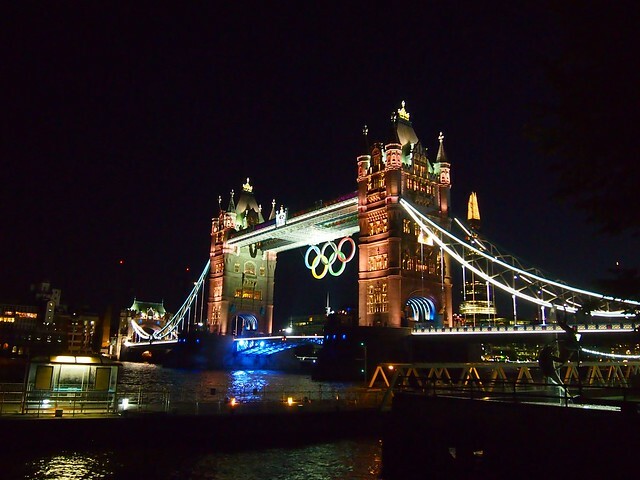 The touristy stuff will always be there; but London will only ever host the Games once in my lifetime! How exciting! I’ve never really dreamed of going to the Olympics, but seeing your photos makes me wonder if I might have to do it someday. It’s an amazing experience. Even just being in London for the Games was fun. The energy and amount of spirit there was really intoxicating! Thanks for the great summary, Akatuki! Haha, yes, there was SO MUCH PINK! How amazing that you got to go!!! 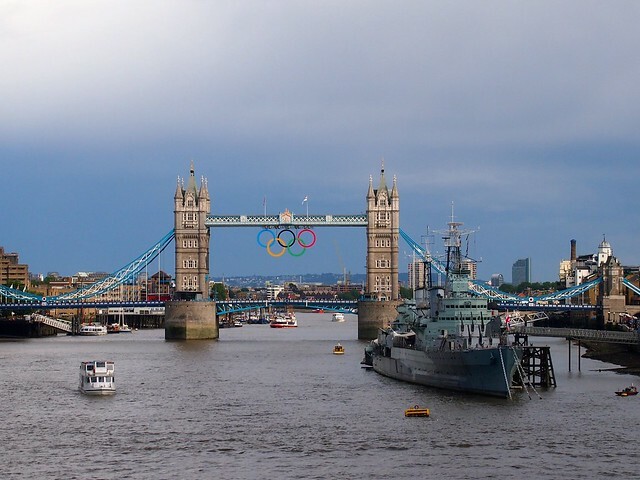 All the photos of my mates going to the Games in London has inspired me to go to one, away from home, in the next 8 years….looking very much forward to the 2024 bid announcement….think I will have to go! You should definitely go, at least once. Even if you only get tickets to a random event, I promise it will be worth it! I’m hoping maybe the U.S. will win a bid within the next 20 years so I can see the Games on home soil! Wow! Was it really hard to get tickets? Or is that why you were at a qualifying round. I can’t imagine how electric it must have felt there! Yes, it was tough to get tickets, especially since I wasn’t from the UK. Which is exactly why I was only at a qualifying round — the tickets I could have snagged for the other rounds were WAY too pricey! Though, once I was in London and they started releasing some of the controversial empty seats, I probably could have gotten more tickets. But my schedule was so packed that I didn’t have time! I’m an expat living in London and feel so lucky to have been here at this time. It’s like 2012 is London’s year to shine. 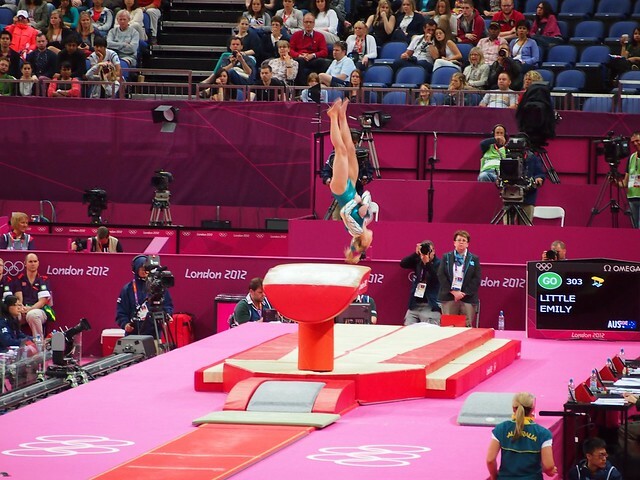 I loved every moment of the Olympics and was thrilled to see some of the events live. Being there to see the USA women’s soccer team win gold and attending the closing ceremony were unbelievable highlights for me. Oh wow you got to go to the Closing Ceremony? Awesome!!! I watched it on TV, and kept thinking that it would have been so fun to see live. That is sooo cool… kinda makes me wish that we had followed through with our plans to fly into Heathrow during the Olympics and see if we could find tickets. I would LOVE to join you in Rio in 2016! I think I’m hooked on the Olympics now! Haha, definitely a pink overload!! Awesome! Did the crowds bother you, though? I find that I can only take crowds for so long..and then I get so exhausted. I didn’t really mind the crowds, to be honest. And, really, I was expecting it to be MUCH worse than it was! Ahh! Great you could visit the games! Olympics are so fun! Cool pics! Glad you liked the pics! I had a lot of fun taking them! I’m so glad you got to experience the Olympics! One of the best experiences we’ve ever had was at the Vancouver 2010 Olympics. It’s hard to capture the energy of the Games with words, but it’s an experience we’ll cherish forever. We now plan to visit the UK for the 2015 Rugby World Cup! Yeah, it’s definitely hard to describe that atmosphere in words (or even photos, for that matter). But I definitely will never forget it! RWC in the UK in 2015, eh? Hmm. I’m going to have to keep that in mind! I purposely wanted to avoid London at all costs because I’m not a huge fan of crowds and the Olympics hasn’t been a major draw for me, until I was traveling through Eastern Europe during them and it seemed to bring tourists and locals together drawn to the television cheering on their respective countries. For me it put a whole new perspective on the event, glad you had so much fun! There were definitely some crowds, and there were times when riding the Tube was not fun… but honestly it was all worth it! The atmosphere was amazing – definitely something I’d love to experience again! Yes, London is big and loud; but I consider those positive attributes! (But then, I live in Manhattan, so . . .) 🙂 I will say that if someone calls London boring, that says much more about the commenter than it does about London. You definitely made the right choice in how to spend your time; London will be very easy for you to get back to (and it’s one of those cities that no matter how many tourist attractions you take in, there’s always more to return for anyway). Your photos, especially of the gynmastics event that you attended, are amazing (looks like a very quick shutter release). What kind of lens were you shooting with? And I highly recommend Rio, although I obviously didn’t see any international sporting competitions when I was there. 🙂 It has one of the world’s great natural harbours, and is just a beautiful city. Now I really want to get back to London, though! I loved it. Sure, my opinion was probably colored by the Games, but still. I want to explore it more soon! And I was just shooting with my Olympus E-PM1 and a 40-150mm lens. Nothing fancy at all, but I’m really happy with some of the shots I got! We’ll have to see about Rio… I’d love to go! First up…”boring”?!?? WHO would call London boring?! London may be a lot of things, but boring is one word you could NEVER use to describe the city. Aww, too bad you couldn’t be there! The energy was so amazing. The UK should be very proud! I am soooooooooooooooo jealous! This would have been my dream trip of a lifetime. Of all the things you’ve done and all the places you’ve been, this is the one that I would given anything to experience myself. You got some great pictures. Wow. What an experience! If our roles were reversed, I think I would feel the same way!!! Going to the Olympics has been such a huge dream for me for so long that it’s still kind of surreal that it happened! Amaaaaaaazing! I went to the Atlanta Games and I’ll never forget them. AWESOME shots!!! I remember my cousins got to go to the Atlanta Games, and I was SO jealous. Now, though, I feel like I definitely made up for it. London was amazing! London really did seem transformed – I hope the atmosphere sticks around for a while, because I absolutely loved it! Wow! it looks like you ha d a great time! I couldn’t go because of the pregnancy and doctor had advised me complete bed rest for a month because of some complications. I couldn’t really visit.. My husband had gone there with some of his friends and they were all praises for the event.! Aww, it’s too bad you weren’t able to go! It really was amazing. It’s my very favorite sport, so yes, it was so fun to see it in person! And London couldn’t have put on a better show. Amazing!! I’ve never even been in a room with so many people, let alone see them jump in the air in a world-hugging event! This was never on my bucket list before, but it sounds incredible! It WAS incredible! Such an exciting vibe – I loved every second of it, and was craving more by the end! Thanks, Samuel! I’m more of a Summer Games fan, to be honest, but I would definitely suggest going to ANY Olympics you possibly can! It was SO much fun, even on my own. 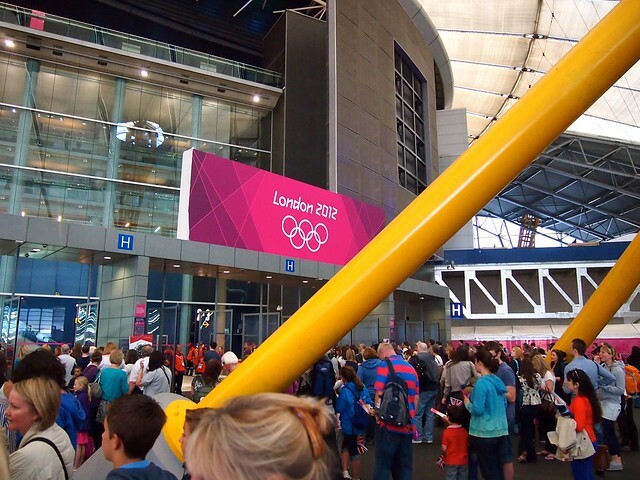 Love this post, so nice to read about London 2012 from a spectator’s point of view. I was there as a journalist and like you, it was my first time in London, first Olympics, and it was one of my biggest dreams that I never thought would happen in my 20s. I was speaking to one of the veteran journos and he said, “It’s so nice to see the Olympics fulfilling not just the dreams of the athletes, but people like you too.” and that’s what I thought of when you said seeing the gymnastics crossed an item off your bucket list — so congrats on that! Great photos too 🙂 See you in Rio? Very cool! I think it would be fun to go as a member of the media sometime, too. And who knows, you just might see me in Rio! Looks like you and I have one of the same life goals…you’ve just done it already! I was a gymnast my whole life and pushing for 2016 in Madrid or my native Chicago. I do have sister-in-law who is Brasilian, though!! I hope you can make it to Rio in 2016, Cat! Going to the Olympics was seriously one of the coolest things I’ve done so far in life. I was in London at that time too! Thanks, Carlos! 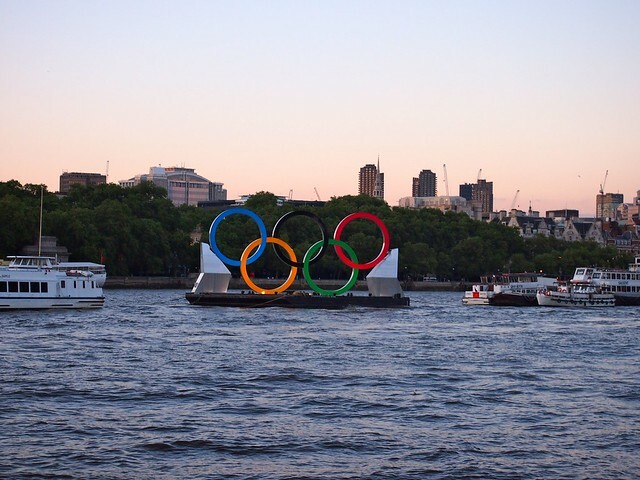 Hope you enjoyed London during the Olympics, too! Oh awesome! I had a ticket to a women’s qualifying round. Sadly, it didn’t turn out to be the round the US women were competing in, but it was still amazing regardless! 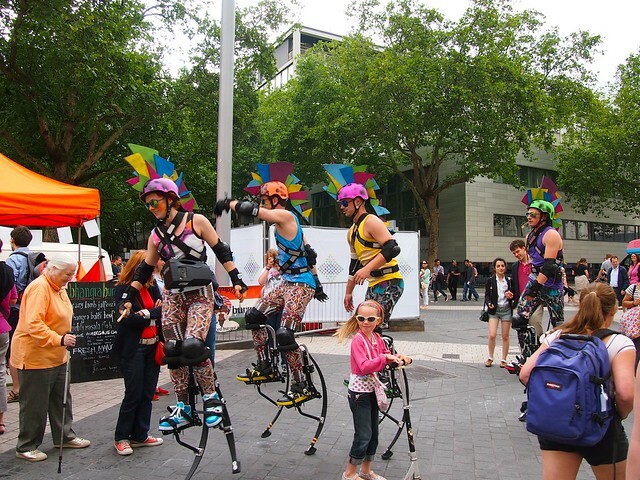 I agree that London during the Olympics was just FUN. What was the secret to snagging tickets? I know I have time but my mom & I are planning on make it to see figure skating in South Korea in 2018 and I’d love any tips or Olympics secrets you may have learned. 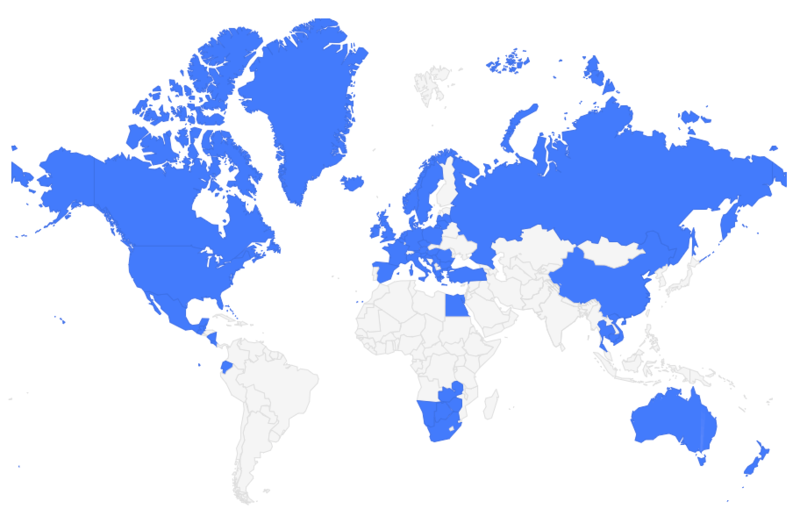 It totally depends where you live, and how your country’s Olympic committee sells tickets. In my case, I live in the US, and a company called CoSport handles sales of Olympics tickets (or, at least they did in 2012). About a year before the Olympics, I signed up for alerts from CoSport and told them which events I was interested in. I didn’t get tickets in the first round of sales (because it was basically a lottery). But, closer to the actual Games, they usually still have tickets to sell and/or more tickets get released to countries based on demand. 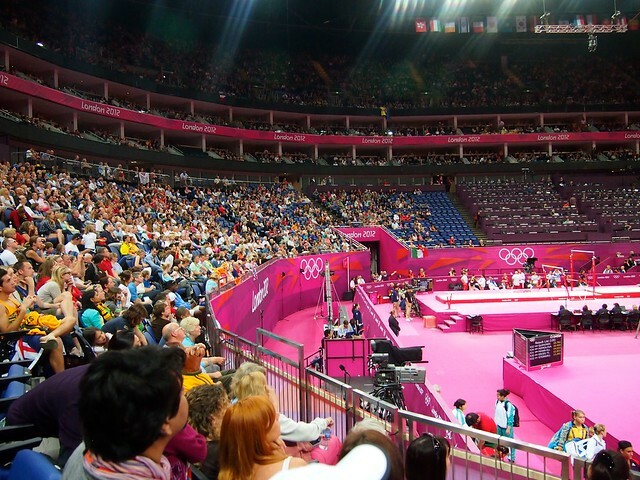 I got alerts saying there would be more gymnastics tickets available on such-and-such a day and that they would go on sale at a specific time – so I made sure I was online and ready to buy right at that time!